My mother Betty has been good enough to pitch in with a guest post today. 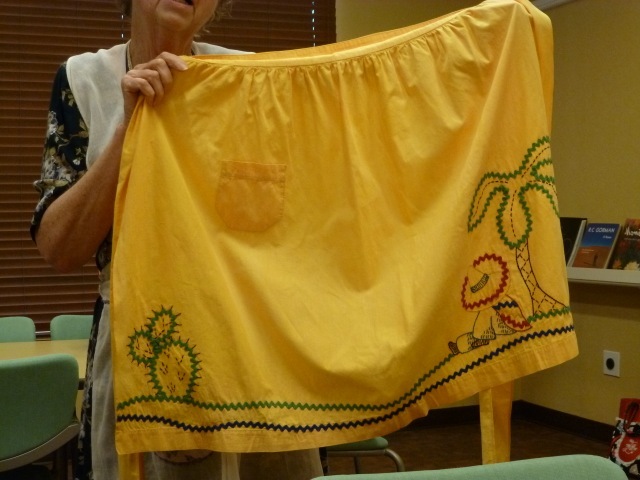 She attended a presentation at the residential community were she lives by a traveling apron-enthusiast. I would have liked to see and touch these beautiful heirlooms but I’m 2,000 miles away. Bobbie Schafer’s medicine show includes a slide presentation and a wicker chest bursting with vintage aprons. 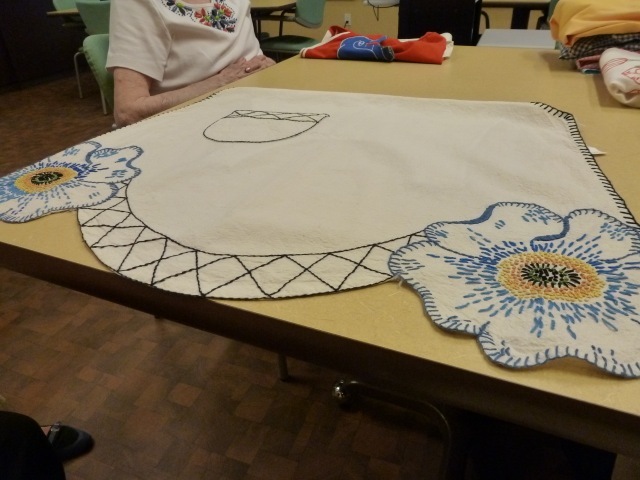 Betty brought a Christmas apron embroidered for her by my great aunt in the late 40s early 50s, topped with a round of plastic. Yes, her waist was that small. All the photos to follow are my mother’s. Hit it, Betty! The original style of apron was called a “butcher” apron. It had a bib top, and covered the dress almost completely, to keep the garment from getting soiled. Washing dresses was not easy then. The homesteaders brought aprons (and rifles) into use. 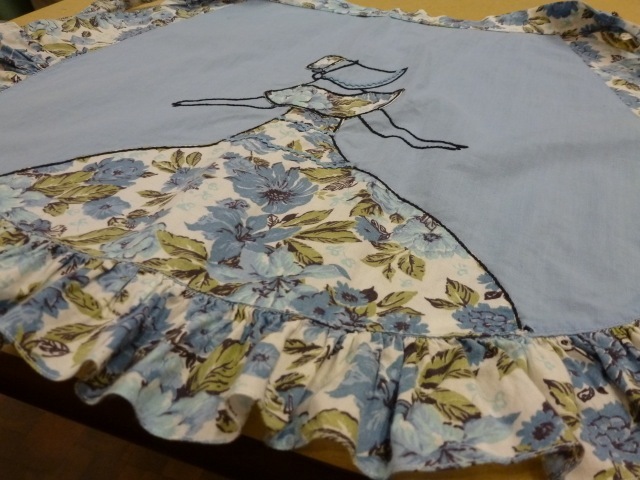 In Victorian times, matrons created their aprons with silk, often with lace. Obviously, the lady of the house used them for adornment, not real use. 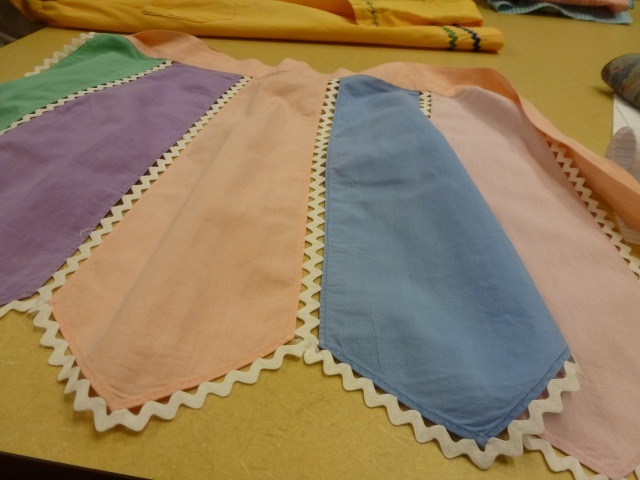 Matching handkerchiefs were sewn together in the 1920s to make hankie aprons. In the ’30s the apron still covered the whole dress. The painting by Grant Wood, “American Gothic,” is an example, also including the use of rickrack, new in the ’30s. Some women wore two aprons, so that when you answered the door, you could quickly shed the outer one and appear in a fresh one. 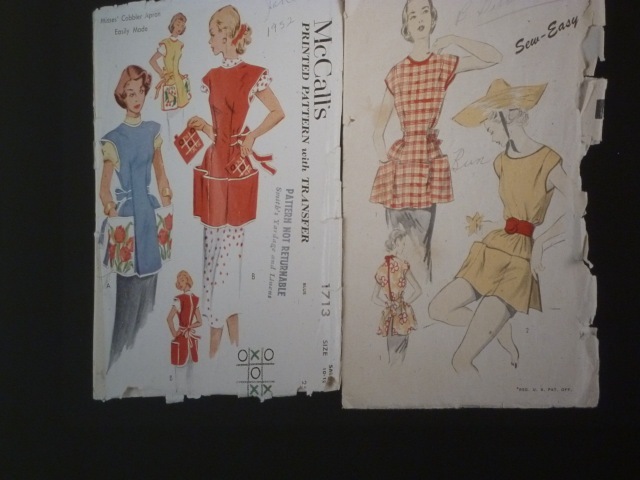 Also in the ’40s, the first patterns for aprons became available, from companies like McCall’s and Simplicity. 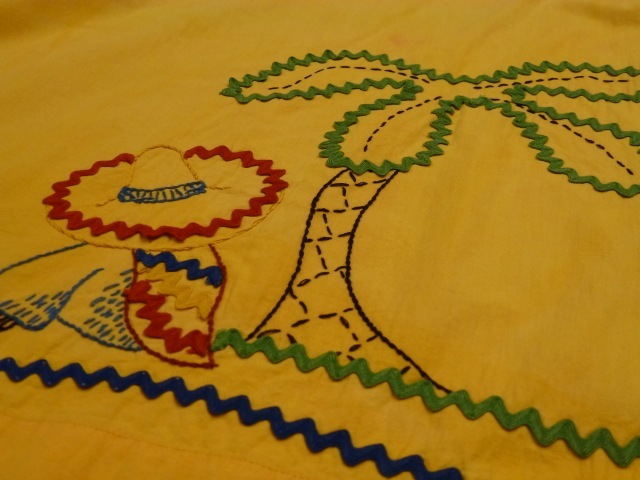 There were iron-on transfer patterns with designs for embroidery and appliqués. In the ’50s hostess aprons were popular, often made of taffeta. 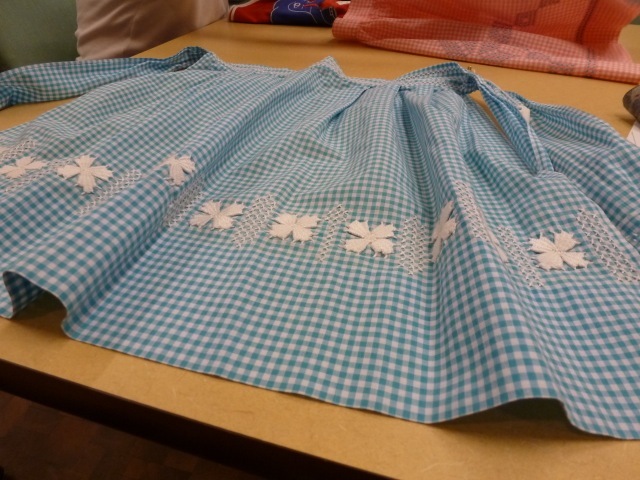 These were party or cocktail aprons. Often they had hearts, spades, clubs appliquéd on them, for use at ladies’ card parties. 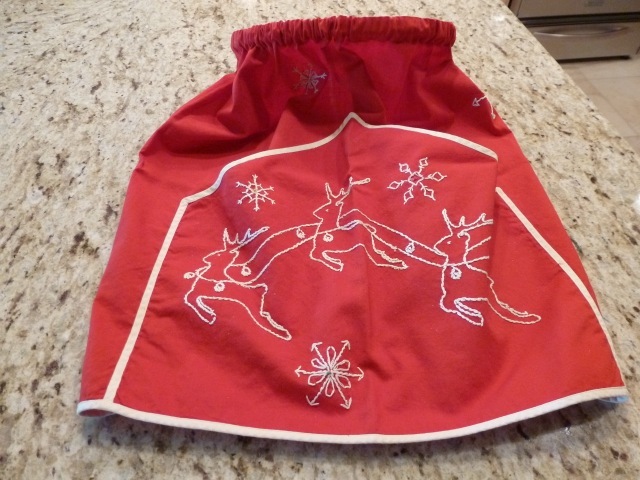 Sometimes women wore holiday aprons, and some had aprons for each holiday. 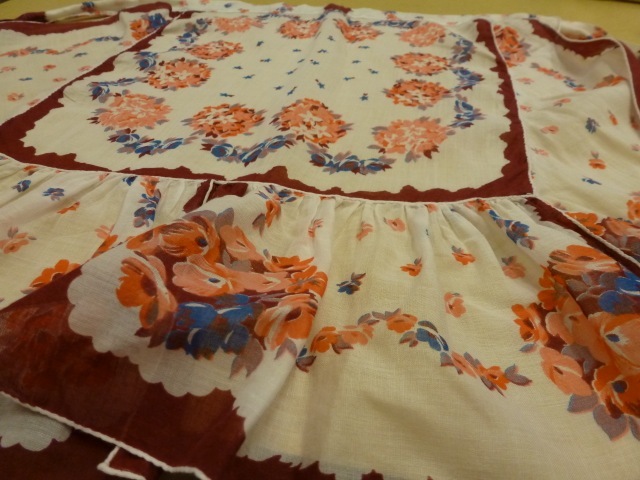 There were also cobbler aprons, or hobby aprons, with lots of pockets for holding tools, etc. And for the first time, aprons for MEN! (These were back to butcher-style.) Real aprons for women went out of favor, as TV dinners had been invented, and women didn’t cook as much. In the ’60s, The washing machine meant aprons didn’t need to cover the dress. Women started wearing pants and with the women’s movement, women decided to throw away their aprons, anyway! In the ’70s, the pinafore style became popular again. Now the apron is back. There are more patterns available than there were 10 years ago. They are popular, even on college campuses, and in stores like Target. Thanks. They can reunite in my storage. They’d study Auntie in Art History 101. Remember that I got some of the linens? Well, I’m going to give them to you. They’re in storage but one day. Might as well keep them together. 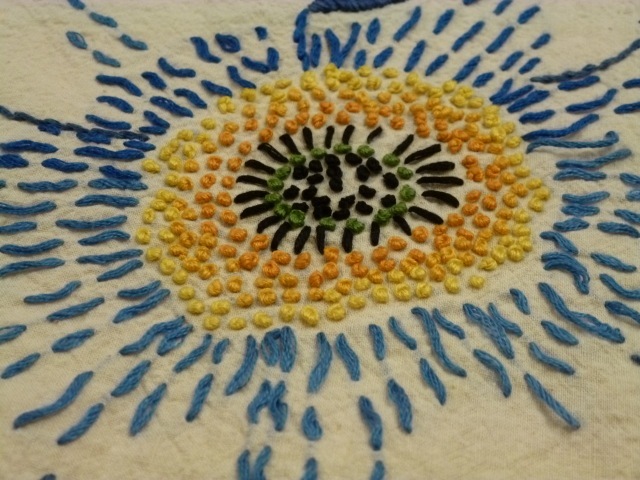 I love the stitching styles! That one toward the beginning with all the frech knots makes me want to run my hands over it. 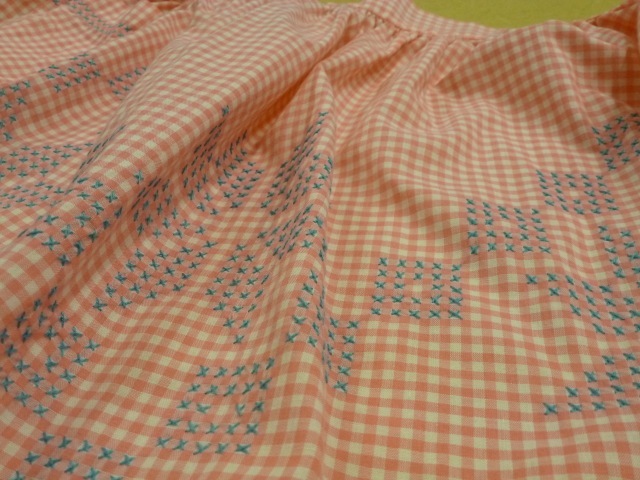 I think I’ll take up embroidery again and make an apron from an old sheet. I’m sorry I missed the show, but I’ve known that Betty is a practiced photographer. Rick-rack makes a fine cactus! Way to go, Betty and Jean!